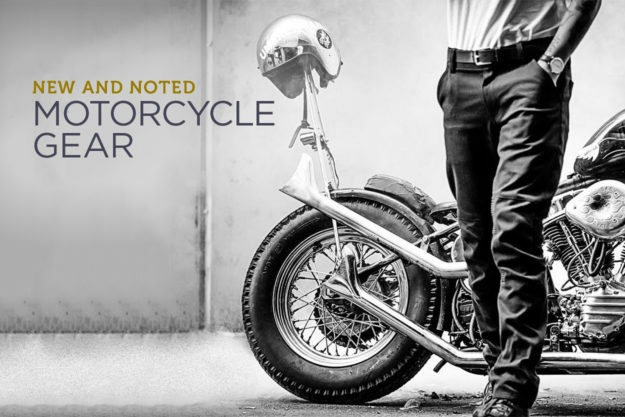 The world’s first single layer, CE-approved riding jeans, a Seiko watch for riders, and Kevlar long johns. Today’s line-up is more eclectic than most, but still capable of inflicting serious damage on your net worth. 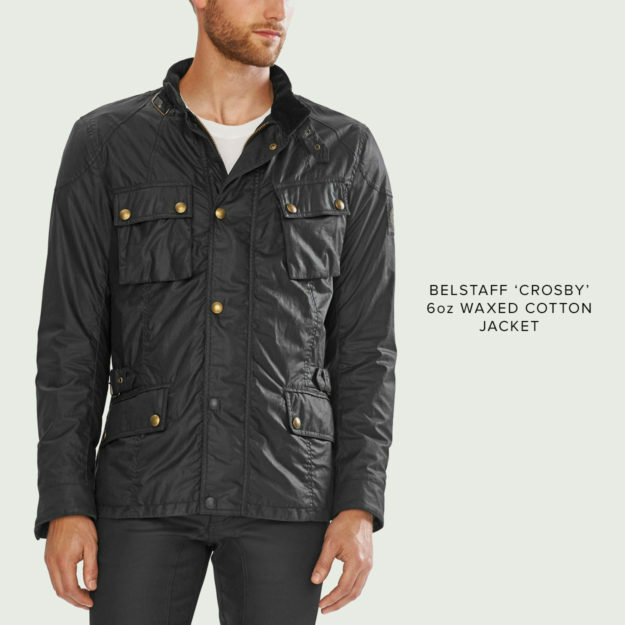 Belstaff Crosby waxed cotton jacket Belstaff’s Crosby jacket is for anyone that digs the iconic styling of the Tourist Trophy, but wants a lighter jacket. The Crosby’s gone through some changes over the years, but Belstaff have finally settled on a 6oz wax cotton construction. It’s heavy enough to be effective, and light enough to handle casual duties. Saint Model 1 Unbreakable Jean I’m virtually inseparable from my Saint denims—even when I’m off the bike. The cut and finish are spot-on, but, more importantly, they’re super comfortable. Why? 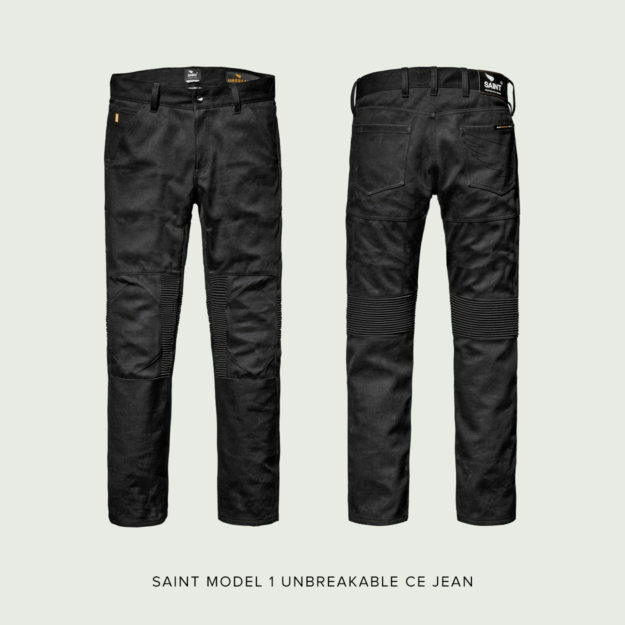 Because rather than line their jeans with Kevlar, Saint uses a single layer of abrasion resistant fabric, making them all-day wearable. Now they’ve taken the concept further with the Model 1: the world’s first single-layer, CE-approved motorcycle trousers. The denim’s constructed by weaving UHMWPE (ultra-high-molecular-weight polyethylene) fibres with cotton, making the Model 1 good for a six second slide time (approximately 75 meters, in case you were wondering). Bowtex Unisex Kevlar Leggings Next on our list: Motorcycle leggings for him or her. Wait, what? Before you lynch us, we’d like to point out that Bowtex’s Kevlar leggings are flying off the shelf. And when you stop to think about it, it makes sense. They’re designed to be worn as a base layer under your favorite Levis or Edwins, offering additional abrasion resistance where it counts most: against your skin. 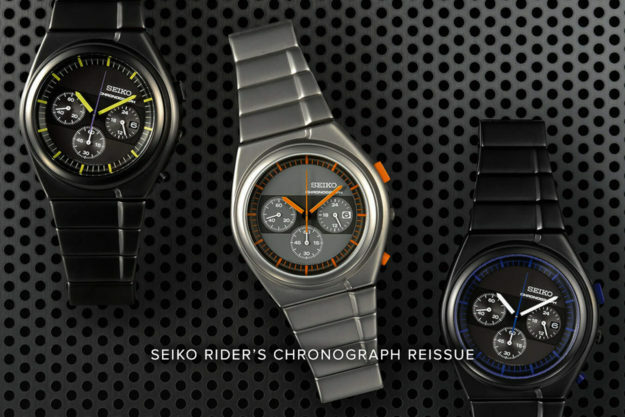 Seiko x Giugiaro Design Rider’s Chronograph Japanese watchmaker Seiko and Italian design house Giugiaro Design have been collaborating on special edition timepieces for decades. This is their latest, and it’s a remake of a 1980 classic. 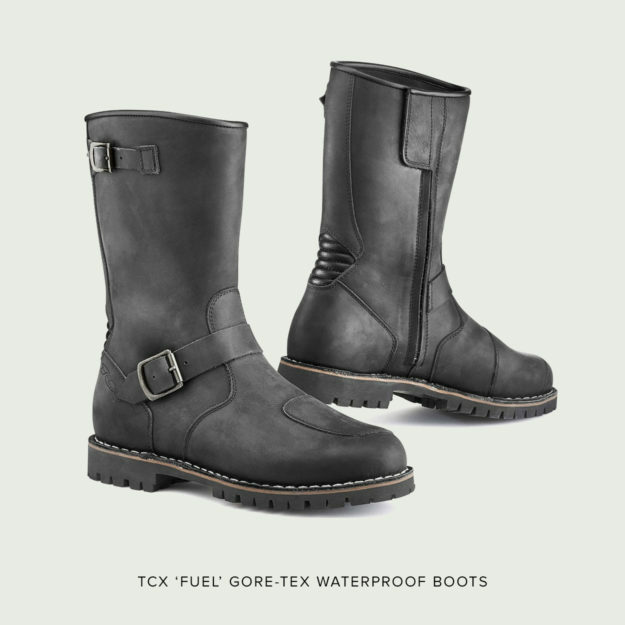 TCX Fuel Gore-Tex boots TCX’s new Fuel boots combine classic engineer boot styling with modern practicality. Outside you’ll find full-grain leather, with a Gore-Tex liner inside to keep things waterproof yet breathable. A side-entry, gusseted zip makes getting in and out of them a cinch, and a Velcro tab adds extra security.